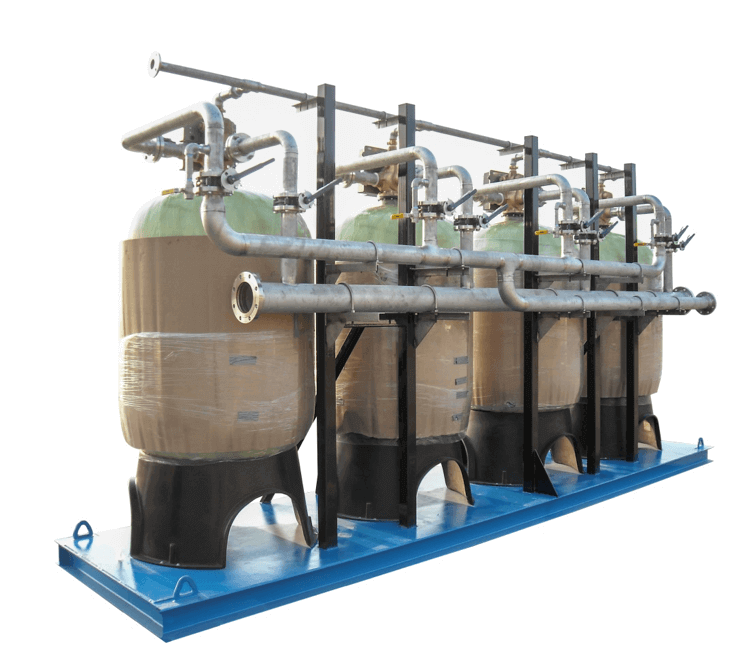 Industrial Water Treatment for Manufacturer Boiler Feed - Robert B. Hill Co.
Our client needed Industrial Multi-Media Filtration and Industrial Water Softeners for their boiler feed application. They are a major manufacturer of wood products in the Southern United States. They came to us and needed a solution to provide high quality water to their new boilers. We took a look at the necessary flow rates, water quality, capacity needed and boiler size. After analyzing their specific needs along with a complete water analysis, our design process called for Quad 48” x 72” Industrial Multi-Media Filters and Triplex 48” x 72” Industrial Water Softeners. To minimize installation time, they wanted the Industrial Multi-Media Filter and Industrial Water Softener to be skid mounted. The Industrial Multi-Media Filters were designed mainly to remove Iron (Fe) before the influent water reached the Industrial Water Softeners. The Multi-Media Filters were engineered for a flow rate of 300 GPM and a daily volume of at least 130,000 gallons per day. There are four Structural 48” x 72 fiberglass pressure vessels. The skid mounted system runs in parallel and backwashes every evening. Each vessel consists of a top mount Fleck 3900 Valve with NXT Controls and a 3” Stainless Steel Meter. Each vessel has sample ports to monitor changes in influent and monitoring the effluent of the filters. The system contains three inch isolation butterfly valves along with 2” Fleck flow controls. The piping is 304 Welded Stainless Steel with a 6 inch header and a 3 inch inlet and outlet to each pressure vessel. The 6 inch header was necessary to provide even distribution among all four pressure vessels. Even distribution provides for much better filtration and reduces the likelihood of breakthrough. The media that was used in the filters was multi-media which consists of various materials and layers. The Robert B. Hill Company multi-media filtration design has been developed over 60 years and is extremely effective when used appropriately for many applications. The Industrial Water Softeners were designed to remove hardness before the influent water reached the Industrial Boilers. 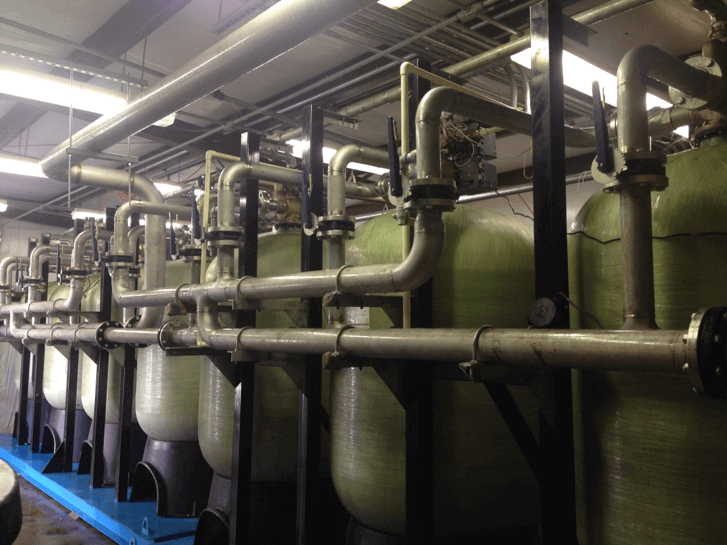 The Water Softeners were engineered for a flow rate of 300 GPM and a daily volume of at least 300,000 gallons per day. There are three Structural 48” x 72 fiberglass pressure vessels. The skid mounted system runs in parallel and regenerates based on volume of water used. Each vessel consists of a top mount Fleck 3900 Valve with NXT Controls and a 3” Stainless Steel Meter. The system displays flow rate and gallons remaining. There is also detailed history data. Each vessel has sample ports to monitor changes in influent and monitoring the effluent of the water softeners. The system contains three inch isolation butterfly valves along with 2” Fleck flow controls. The piping is 304 Welded Stainless Steel with a 4 inch header and a 3 inch inlet and outlet to each pressure vessel.